Hello, this is my re-introduction to the GSC boards and the leadership. My focuses within the team special projects, and knowledge on Glyn Dillion’s officer costumes as seen in Rogue One. 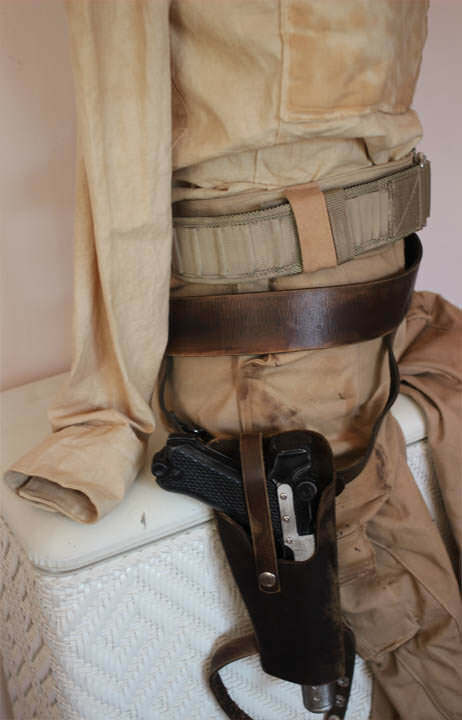 I love the utilitarian look of the costumes within this world and the mix of vintage military goods. With that said, here is my generic Yavin Officer. My hopes are to make a “hero” one and have it’s details match, as close as I can, to Cassian’s. It’s a way to challenge myself and try to learn a few more tricks. 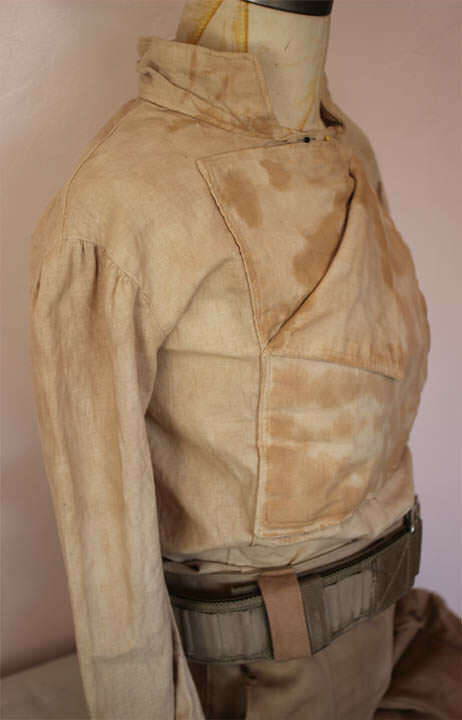 As of right now, the approved standard lists canvas or canvas like material on the jacket. To be perfectly honest, I’m not super good at identifying a fabric unless I worked with it before, so it seemed reasonable enough at the time to commit. Boy...I was a little too idealistic. The canvas isn’t too bad to work with until you get to having to sew the characteristic Glyn Dillion decorative topstitch. Although I found specific topstitching needles the weave of the canvas makes the needle skip back and forth that result in really crooked topstitching. It’s the sort of thing that I am naturally inclined to rip out immediately and try again. Which I did, but not to real great effect. I’ve tried since then sewing on the bias to see if it helped with the stitching, I’ve tried altering the stitch width and then the weight so it came out slightly thicker. I even went to the sewing machine shop because I was worried I might have messed up the Bernina, where the workers tried stitching on a heavy duty Viking....with no luck. I’m really curious if the jacket is canvas, is it something that can only be done with a professional machine? So I’ve chucked all of that nonsense. First up is the tunic, I can’t recall what pattern I used as a base but I modified in the rectangular bib and the seams on the sides. For fabric a very nice, heavy weave of linen that started as white that I stuck into a tea bath. I am not the greatest at dye jobs so far, so my personal preference will always fall back into tea, and it always readily available at home. 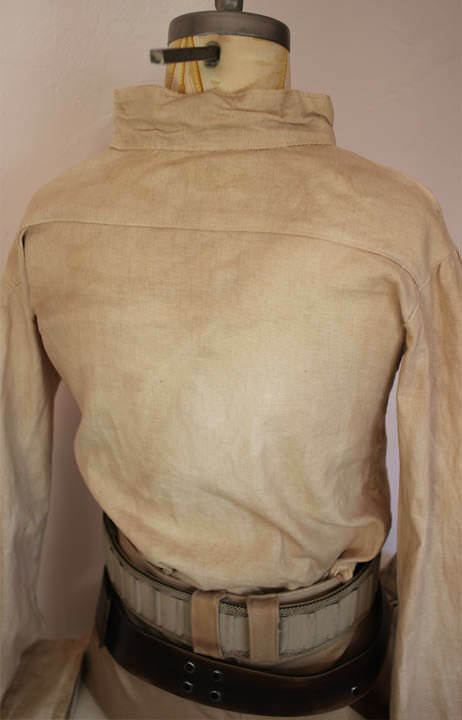 The back has the yoke, and button cuffs that I added on as well, all topstitched because it’s a Glyn Dillion tradition. I’ll add on the closures to the cuffs during my final fit test. 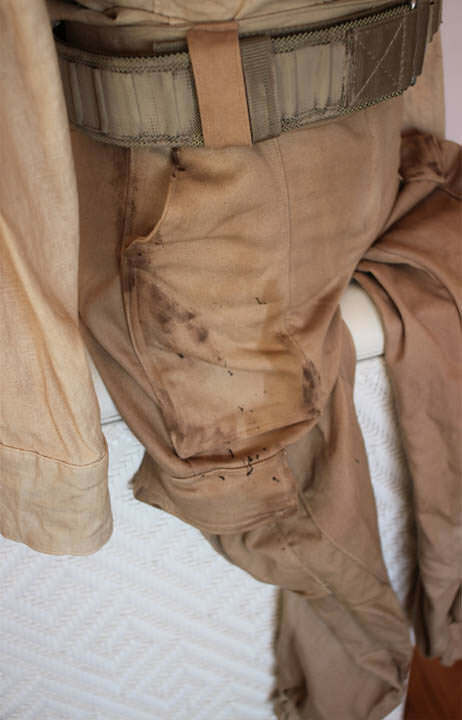 The pants are made from a lightweight denim that has been sitting in my fabric stash that started out a nice neutral taupe color and then were dyed into camel colored. 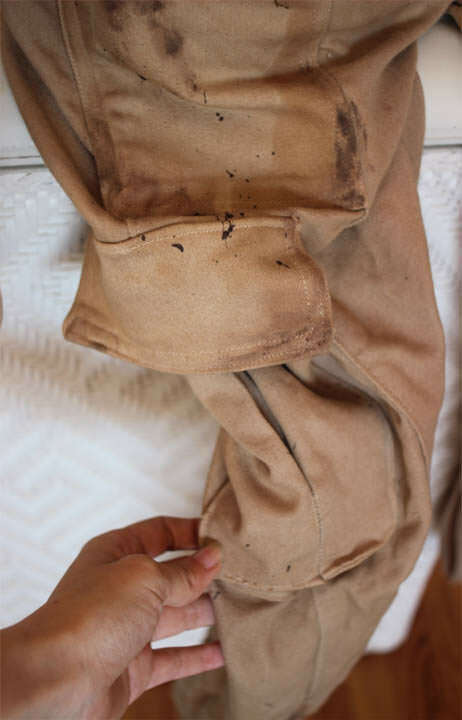 I used the same pattern as I did on my Jyn Erso pants with the modifications to add on the upper pockets, the pleated pair of cargo pockets then the elastic cuffs. I added the belt loops, two on the back, and made them slightly larger to fit the British PLCE belt. My belt was supposed to be the “sand” color instead it arrived and looks more olive. The military webbing on it was certainly more green based, I talked a bit with a Jenna, one of the Cassian judges, and confirmed that the belts that have been sold under the “sand” color have been arriving that way. To offset it, I painted it although I will probably go back and weather it a bit. Please excuse the fit on the dummy, they don’t properly close on her and there isn’t anyone around to photograph me while the lighting is still nice.